When I look back on 2013, I’ll think of many things. But, as far as my business is concerned, I’ll think of 2013 as the year when I first created Udemy courses and Kindle books. But, the funny thing is, I do sleep – quite a lot, as a matter of fact. I get up late and spend time making breakfast with no particular idea of what I’m going to do that day (tut, tut). OK, if I’ve got client work to do, I’ll do it. I’ve had loads of it in the last few months whilst I’ve published these Kindles and I still feel lazy. You wanna write a Kindle? Open up Word (OK, maybe not, but we’ll get to that later) and write. It really is as simple as that. Putting a Kindle book on Amazon – and getting it in front of billions of eyeballs – is as easy as uploading a Word document on a webpage. Now, if you want to get technical, then maybe Word isn’t your best bet because of its formatting and HTML shortcomings. But it’ll do for your first shot. Maybe think about subject matter, target audience, and all that. But, really, if you want to do it, just do it. The best thing about my Kindle adventure is that I didn’t think about it much. I didn’t spend ages researching into Kindle strategy and planning. So many new projects can get weighed down with the overwhelming information that one feels the need to consume. This quickly becomes a burden and clouds the thinking. Do it to widen your audience. Do it to build your brand. Do it to educate, to inform or to entertain. That way, if you do make any money, it’ll be a bonus. I may make $100 this month, that’s over $1000 a year. That’ll buy me a new … er … smartphone. And, as if that wasn’t enough, I’m now a published author. Who would’ve believed that? If punk rock was the democratisation of music, WordPress the democratisation of web publishing, YouTube the democratisation of film-making, Amazon’s Kindles are the democratisation of book authorship. Really, the world has changed. For years I’ve been a big fan of Steve Scott (this won’t be the last time I mention him). One of the many things I got from Steve was to publish non-fiction Kindle books of 10,000 words and publish loads of them. I’m sure many new Kindle authors have fallen by the wayside by putting everything into their first book, by creating a paperback-length, 100,000-word tome and getting bogged down by the sheer size of the project they’ve undertaken. In my first book, Running A Web Design Business From Home: How To Find and Keep Good Clients and Make Money with Your Home Business, I left out loads of possible content. Pace yourself, I thought. If I’ve got more to write, that’s great. I’ll publish it another day, under another title with other keywords which may interest other people than the ones who’ll read the first book. This is similar to what I’ve learned with Udemy courses. Create multiple products. You are more likely to succeed with five products than you are with one. It widens the net. This should be obvious. 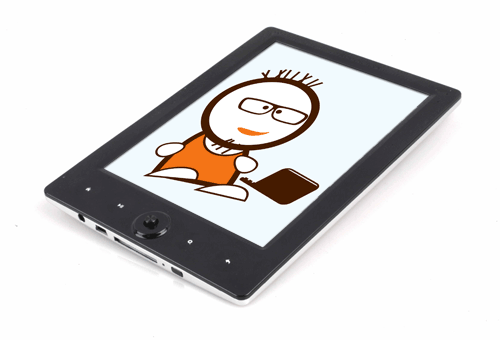 If you want to create a great Kindle book it’s necessary to read great Kindle books. Kindles are not extra long blog posts nor are they short versions of paperback books. And saying they are something in between is probably not accurate either. So download the Kindle app on your laptop, tablet or smartphone and read, read, read. You may think it weird to read on a smartphone. But I do this quite often while waiting in queues and the like. The Kindle app syncs across all your devices so you can pick up from where you left off easily. This is something else I learned from Steve. You must map out, in as much detail as possible, a “skeleton” of your Kindle. This isn’t just about the chapters in the book, this is about the sections within those chapters, and the sections within those sections within those chapters. The more detailed the skeleton is; the more time you will save later. The main thing that’ll stop the flow of your writing is not knowing what you’re going to say next. This is something I stumbled upon, quite literally. A couple of months ago, embarrassingly enough, I fell over and broke my arm. During the first few weeks after the accident, I had to use dictation software as I couldn’t type. I now use it half the time I write. Mac has native dictation capabilities in 10.8 Mountain Lion (System Preferences > Speech & Dictation). I’ve yet to fork out for the Dragon software, but I may do soon. As a graphic designer, it is somewhat slapdash of me to say “open up Word and write”. Word actually creates some of the most unpleasant looking HTML you’ll ever see. And, it’s probably better if you get a freelancer to format your Kindle. What do you look at when you’re deciding what book to buy at Amazon? The title, the author, the cover, the reviews and the first few pages when you “click to LOOK INSIDE!” These are what you should concentrate on to sell your Kindle. Run your title and cover ideas past as many people as possible. Pat’s Facebook Kindle group is good for this. Remember, though, you can change the cover, the title, the content, anything about the book after publishing. When you’re ready to upload your Kindle, go to kdp.amazon.com and set up an account. I found this walkthough of the publishing process particularly helpful. You need to spend a bit of time on the categories, keywords and description of your book. Employ a bit of commonsense SEO-type thinking here. Create an author profile of yourself over at Author Central, write a good bio, link it to your blog and your Twitter. 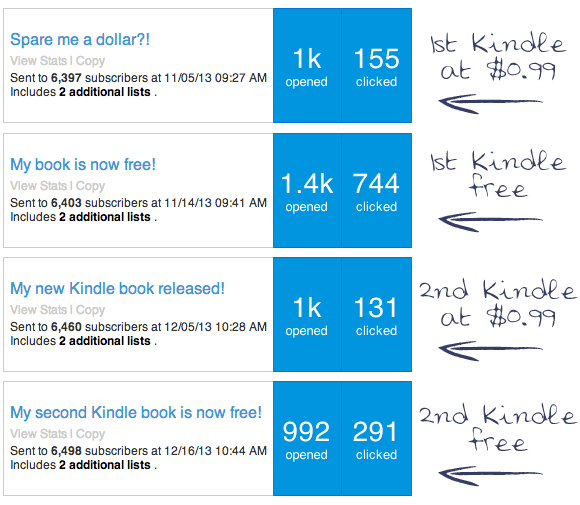 Again, there are probably loads of really clever Kindle pricing strategies but I just couldn’t be bothered with them. Instead, I published both the books at $0.99 for a couple of weeks before a five-day free promotion and then moved the price up to $2.99. I figured that I’d get a few good reviews from “early adopters” with the initial low price and then a few more good reviews when thousands download during the free days. This worked well for the first one but not so for the second. Detractors will argue that a lot of people won’t read the free books and that the audience is less targeted. But, on the other hand, this exposure is bound to get a few new fans to your website and signing up to your email list (which you should promote in all your Kindles). I will probably experiment a bit with Kindle’s new Countdown Deals where you can offer the book at a reduced price for a limited time. Customers can see the regular price and the promotional price, as well as a countdown clock telling them how much time is left at the discounted price. Another thing I’ve re-learned this year is this: you can’t beat an email list. Email lists are great for drumming up initial support for products. For my last two books I emailed my list twice, firstly to say the book was out initially at $0.99 (but that it would be free for a short period soon) and secondly at the beginning of the five-day free promotion. As you can see from the above AWeber stats, both got a similar amount of interest initially at $0.99 but the first book was much more popular on the free promotion. It seems my second book, How To Sell Video Courses Online: How I earn $1000+ a month while I sleep was much less interesting to my audience than the one about web design. It is possible to build an audience on Amazon alone but I would always advise aspiring authors to create a following around a blog and to start an email list first. Generally, I would avoid promoting your free Kindles onto the plethora of Facebook groups and Twitter accounts that specialise in free books. Stick to what you know. Only promote your book to groups and communities where you know you’ll receive a favourable response – like your own community. I’m sure there are lots of little tricks like link building and self-promotion through social media, but I’m uneasy with this sort of untargeted marketing. After the initial boost from my email list and the free promotion, these books are selling 2-3 times a day. I’ve no idea whether that’s any good or not but I don’t care much either. To me, the most pleasing part of this adventure was that I put all my effort into the product and very little into marketing – and that’s just how I like it. You can be a published author. Enjoy writing and try to make your book as helpful as possible. If you have any questions about the Kindle publishing process, leave them in the comments or drop me a line. There’s an excellent closed Facebook group called Pat’s First Book (From Start To Finish). Ask to join that group where there are some real experts. One of them is Steve Scott who is writing a wonderful Kindle publishing Q&A series at the moment. And this Pat Flynn interview with Jeff Goins is particularly good on the marketing aspect. Great tips Rob. I’ve been thinking about writing e-books for a while, and this might just persuade me to do it! I would definitely go for it if I were you, Phil. I would love to know more about PR as I think you can explain a lot that would help people like me and my visitors here that run small businesses. We would love some ideas about how to get noticed by the “big boys”. You are absolutely right on this. People should try it. I didn’t know if I could do this or not but I did in the end. Got a few books out eventually. Shalu, thank you so much for your comment and welcome to the site! I was exactly the same. I was wondering, can I do that? Am I capable? And then I did it and I thought, OK, I know I can do it now, it wasn’t too bad, now I can try to do another one. Good point! Rob I was so inspired that I’ve started writing my Kindle eBook again, I’ve more or less been working on and off it for approximately 6 months but I finally got it finished a few days and I’ve just launched it on the Kindle Marketplace. Do you have any advice as to how I could market and sell my eBook and somehow push it up on the Amazon Charts. Hello Mitesh, I’m so glad you were inspired by this. I’m afraid I don’t have any easy solutions to your issue. The best way I know to market a Kindle book, as I say in the above article, is to have an email list where you can ask for reviews. All other forms of marketing (endless pasting of links to FB groups, Twitter profiles, etc.) I would discourage. Another important factor is the subject of the book. If you are solving a specific problem that a lot of people are having you’ll find it easier to market your book. Your subject matter, HTML and CSS, is very general and, unless you are an established authority on this, very difficult to market. Love the idea of putting the effort into the book, not the marketing. All that stuff can get overwhelming. My 2nd book is now live, and I’m heading to set up a free day now!